The Mayline Napoli 87" W reception desk offers clean lines, floating surfaces, and stylish use of glass and metal. Long-lasting 1-1/8" thick veneer work surfaces with distinct beveled front edge. The transitional style allows it to fit into any environment whether it be modular multi-station work areas or executive offices. CARB 2 compliant: core materials comply with Phase 2 of CARB's formaldehyde emission limits of composite wood materials. Available in mahogany finish on walnut veneer. 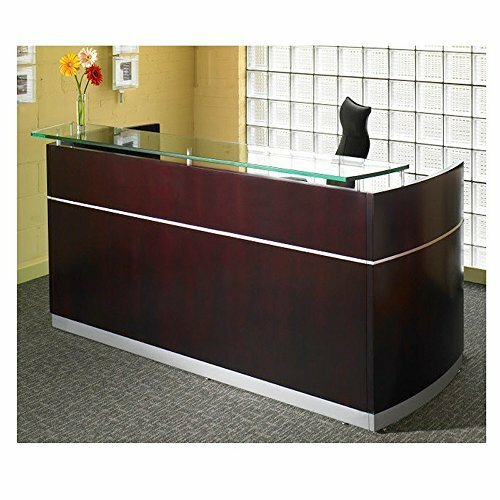 Sorrento Reception Desk Bourbon Cherry Finish Dimensions: 72"W x 39"D x 45"H Weight: 481 lbs.